ORLANDO, April 2 – Westminster Oaks and Westminster Communities of Florida are delighted to announce that our newest neighborhood in Tallahassee, Canopy Oaks, has been certified for its environmental sustainability under the National Green Building Standard Bronze Level. This award recognizes that the design and construction of Canopy Oaks contributes to energy efficiency, environmental conservation, health and durability of construction. 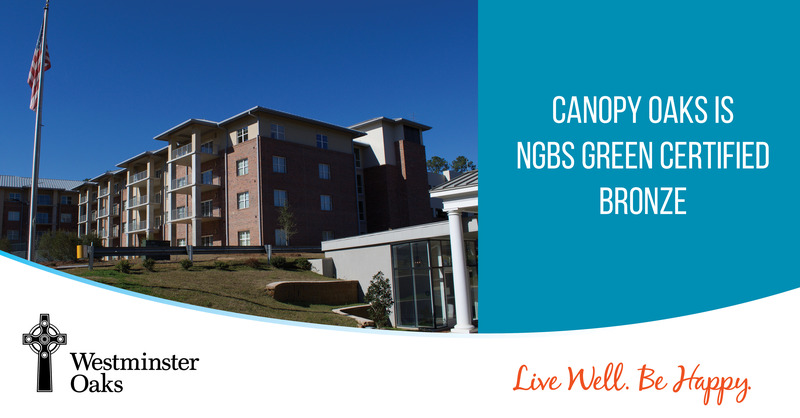 Built by general contractor Cook Brothers Inc., the new Canopy Oaks features 40 spacious one- and two-bedroom apartment residences at the crest of a hill on our beautiful campus in Tallahassee. Residents will enjoy an active and independent lifestyle with a wide variety of activities and assistance. Canopy Oaks also houses a new, state-of-the-art Fitness Center and a new parking garage for the community. Congratulations to Westminster Oaks, the Westminster Communities of Florida Construction & Design Department, and Cook Brothers Inc. for this recognition of the environmental sustainability of Canopy Oaks. Westminster Oaks is a Continuing Care Retirement Community set amid the rolling hills of Florida’s capital. The community offers active, independent living, featuring Westminster Communities of Florida’s exclusive My W Life program for wellbeing of mind, body and soul, as well as assisted living, nursing care, therapy and more. To learn more about Westminster Oaks and Canopy Oaks, visit us online at www.WestminsterOaksFL.org or call (850) 878-1136.